I am absolutely convinced that we are going to be the victims of pickpocketing while in Europe next month. Call it paranoia, pessimism, or mental-preparation, but I just have this uneasy feeling that we'll come back from Europe considerably lighter than planned. Perhaps it's because we've been so fortunate thus far. We did have one pickpocket attempt in 2010 when in Augsburg, Germany. There was a vibrant street-festival in full swing as we wandered through the streets, and as we walked back to our bus, I noticed that my purse was partially unzipped. Nothing was stolen, but as my tiny purse had been clenched tightly between my arm and side, I was astonished that anyone had even tried to pilfer it! Or perhaps it's because I've been reading about so many thieving instances in Rome or because my co-worker just had his iPhone stolen in Paris. Maybe it's a good thing that my new phone won't actually work in Europe (darn you, lying customer service reps!) so it's one less valuable item to go missing. 1. Wear a money pouch. While neither fashionable or particularly comfortable, we will be utilizing a money pouch or two for this trip. It fits snugly around the waist and under your clothing. So long as you're not flashing it in public, no one's the wiser that you have extra goodies stashed out of view. A pickpocket may be able to get in your pocket undetected, but I think I would notice if someone had their hand down south, if you know what I mean. 2. Locks on our luggage. We've actually never put locks on our luggage -- not out of excessive trust of our surroundings but simply out of laziness. We will this time. I won't be locking our checked luggage until we collect on arrival, as TSA may arbitrarily decide to search my bags and they'll simply cut the locks. So while I can't prevent theft by the TSA (other than keeping all valuables in my carry-on), I can deter thieves from nipping into our bags when we're maneuvering through the unfamiliar and potentially packed train system in Italy. And although our hotel in Pompeii and hotel in Rome look fairly secure, unprincipled staff can work even in the best hotels, so I will be keeping our luggage locked even when left in the hotel room. 3. Don't look like a tourist. Now this is easier said than done, and ultimately, a good pickpocket will be able to detect that we're tourists. We usually do a pretty good job of dressing like locals, although I've had a few faux pas in the past (e.g., wearing too short shorts), but this part is always harder for my husband than me. He is most comfortable in a loose t-shirt, shorts, and flip-flops. And almost every site says that the fastest way to scream "I'm an American tourist!" is to wear flip-flops in Europe when not at the beach. So I bought my husband some slip-on boat shoes; they may still mark him as a tourist, but at least not as obviously as his beloved flip-flops. 4. Be aware of your surroundings. This is where my martial arts training and my natural distrust of public places comes in handy (although, yes, my awareness semi-failed in Augsburg!). Don't fall for the fake "tourist-policemen" scams, the I-need-your-help-with-directions distractions, the take-a-flower-offered-by-a-child-and-then-the-parent-demands-payment scam, etc etc. 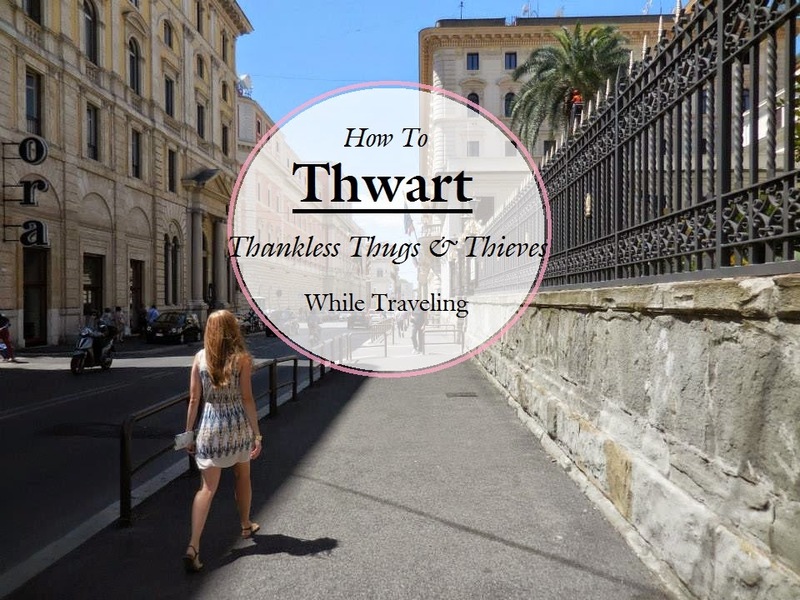 This website has detailed a lot of pickpocket tricks that will have me on high alert, especially when we're in Naples and Rome. In the picture to the left, I'm looking very distracted and tourist-y while in London, but my husband was right beside me and there were virtually no crowds. 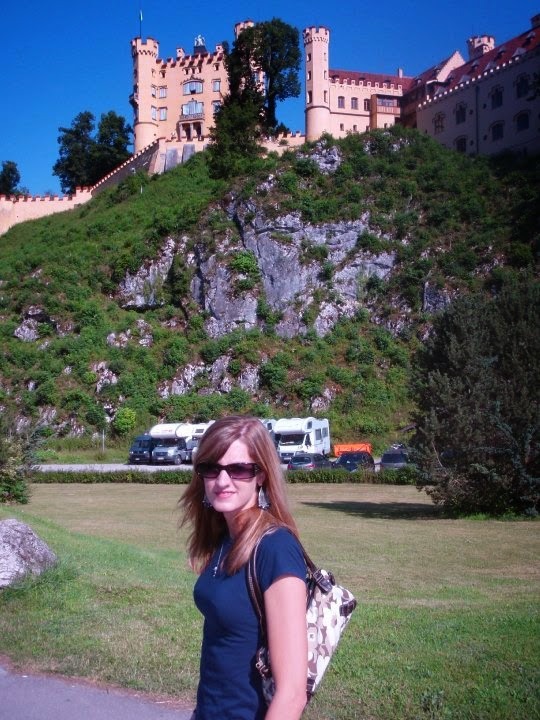 I will not be this oblivious-looking in Italy, that's for sure! 5. Make photocopies, know where the police stations are, and where your consulate is located. Italian hotels are required to hold your passport on check-in for the local police to inspect, so they should be relatively safe while you are not in transit. But if your passport is stolen, it will be easier for the consulate to provide a replacement if you already have the pertinent information. Same with your credit cards. Write down their numbers and the (international) phone number of the issuing bank for you to call in the event that the cards are stolen. Before you leave on your trip, have at least a vague idea where the police stations are and know where your embassy is located. Hopefully, we will not be the victims of theft while in Europe, but it's good to make sure you've prepared for all contingencies. Have you been the victim of theft while traveling? Do you have any more tips to add? Luckily, I've never had any problems. I think remaining aware of your surroundings is really important. My husband always carries his wallet in his front pocket not his back pocket and we always carry bags/purses that zip. It's definitely the smart way to go. I think I may be slightly paranoid, but it seems that almost every blog post I've read about Italy lately is about getting ripped off in some way, shape, or form. Oh, well, if I prepare for the worst, then I'll be ecstatic when nothing bad happens! I am sure you will be fine! There is nothing wrong with looking like a tourist as long as you are sensible and aware of your surroundings. Even locals get robbed, just be careful and take precautions to protect yourself and your belongings without putting a downer on your explorations of the city. Thanks! I'm sure we will be, but I tend to be melodramatic at times. ;) I think the reason I am so concerned about being pickpocketed is that I've been reading the blog of a local who has experienced a lot of trouble in that department lately! Still - we will have a blast and hopefully not spend/lose too much money! I would say just don't bring anything nice!!! And I'm with you on the money pouch - I'm on the look out for a chic fanny pack! I believe it can be done!!! I'm sending you positive thoughts, but it always helps to be prepared! It's funny because I was recently looking back through some of my pics from Nicaragua and was wondering why my stomach looked so pooched when I remembered that I had a money belt on underneath my clothes. They definitely come in handy although they can be somewhat hard to maneuver when you need to take things out of them in public. Definitely be careful on the metro in Rome. When we were there, it was closed at the time we were planning on taking it, but maybe that's a good thing because I've heard my fair share of horror stories about pickpockets on their metro.